A little Sunday morning news then. First up from England, visitors of the "Empire Presents... Big Screen" movie festival were shown two scenes from John Carter of Mars and Empire's web site has a run down of what was shown http://www.empireonline.com/news/feed.asp?NID=31774. The footage according to the article was the same footage shown over a month ago at the "Edit Bay" presentation. I wonder if this footage will be shown at next weekend's D23 Expo as well? I guess we'll find out. Also it looks like John Carter might have shot a masked man in the back with a silver bullet. As has been widely reported Disney has pulled the plug on their big screen version of The Lone Ranger with Johnny Depp as Tonto due to budget concerns. Deadline Hollywood first reported this, claiming the budgets of both John Carter and Sam Raimi's Oz: The Great and Powerful were responsible for the cancellation. Interestingly (and several sites are still reporting this) the article suggested that John Carter's budget alone had reached a whopping $300 million thanks to "extensive reshoots." The current version posted http://www.deadline.com/2011/08/shocker-disney-scraps-johnny-depps-lone-ranger/ now lists $250 million. Those tattoos must have cost a lot! 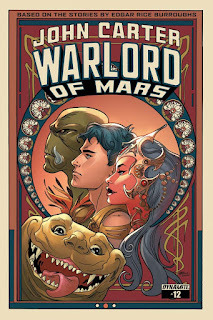 World of Mars #2: Thoats and Apes! First Look at "Flash Gordon: Zeitgeist"
John Carter: D23 Is On!